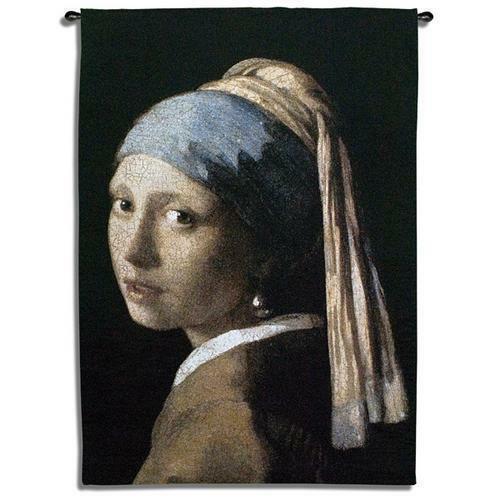 "Vermeer's Girl With The Pearl Earring Wall Hanging" The painting Girl with a Pearl Earring is one of Dutch painter Johannes Vermeer's masterworks and as the name implies, uses a pearl earring for a focal point. The painting is in The Mauritshuis in The Hague. It is sometimes referred to as "the Mona Lisa of the North" or "the Dutch Mona Lisa". The high quality tapestry is woven on Jacquard looms. Includes rod pocket and weighted bottom for easy hanging. Cotton blend. Spot clean only. Measures 38" wide x 53" long. Note: Rod not included with this item. May be purchased separately in my store. Request adjusted invoice for combined shipping when ordering a rod or tassels with this item. PLEASE NOTE: Shipping ONLY within the continental U.S. Hawaii, Alaska, and Puerto Rico residents please contact seller for shipping quote before ordering.